This wonderful watercolor and gouache head study of Tibs the Springer Spaniel dog is painted by the celebrated British artist and illustrator Reuben Ward Binks (1880 – 1950). Binks was the leading canine artist of his day, his specialty wasn’t s sporting dogs. The painting is signed and dated ‘R Ward Binks 1922’ and housed under glass in an attractive modern frame. Binks was commissioned by the Countess of Howe to paint an entire series of her sporting dogs, including Springer Spaniels and Labrador Retrievers. Soon after Binks was commissioned to produce dog portraits for the Duke of Gloucester, Duke of York, he painted the spaniels of King George V, Cairns for King Edward VIII (Prince of Wales), Retrievers for King George VI and the pet's of Princess Victoria. Those paintings are displayed throughout the Royal country residence at Sandringham. Binks was also very successful overseas. He spent eight months in India painting the gun dogs of the Maharajah of Patiala. He traveled to America twice and completed commissions for several prominent dog fanciers including over 200 prized dogs owned by Mrs. Geraldine Rockefeller Dodge. Measuring: Frame width 16.75 inch (42.5 cm) by height 18.75 inch (47.5 cm). Aperture width 13 inch (33 cm) by height 15 inch (38 cm). Condition: As with some paintings of this age there is some minor blooming to the paint around the dogs head and there is some very minor foxing to the background. The frame is in good, sound condition with some very minor bumping to the corners. This is a fabulous watercolor by a talented artist who painted for the Royal Family. 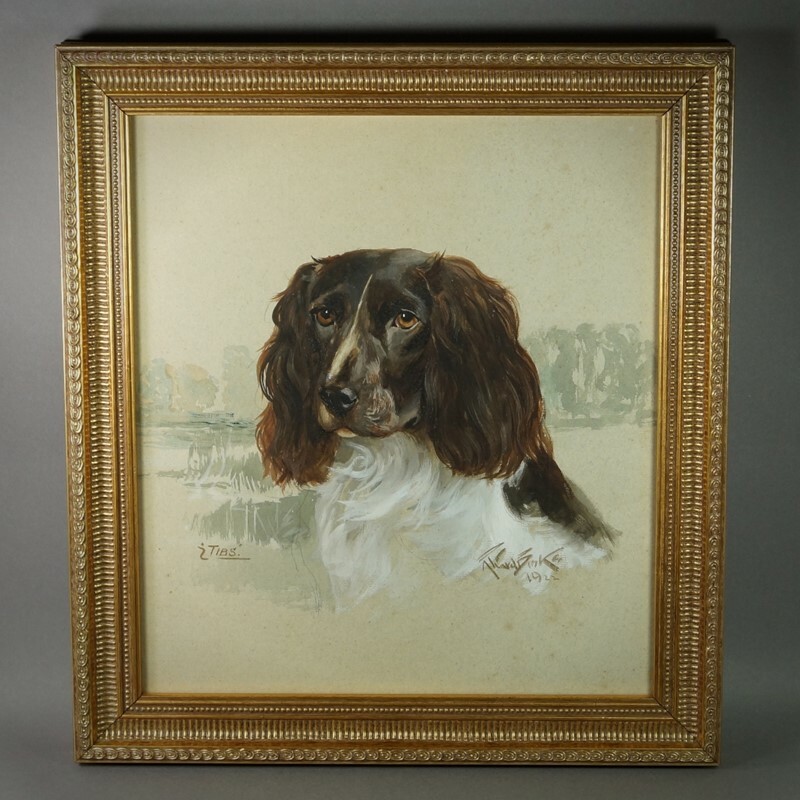 It is the perfect artwork for an animal lover or Springer Spaniel club member.